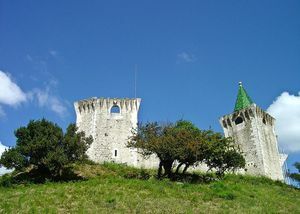 This garish castle with green towers was originally a Moorish fortress. It was conquered by Afonso Henriques in 1148, completely refurbished in 1450, and so again after the 1755 earthquake. Currently the castle looks over the top to be a Medieval castle, specially due to the spotless green tiles. Despite this, it is a really funny and interesting visit, having the chance to enjoy from here amazing views over the valley and the Serras del Aire e Candeeiros Nature Park. It is worth to stay until it closes to see how they do it with a huge key. Porto de Mós, Leiria, Portugal. From Tuesdays to Sundays from 10:00 to 12:30 and from 14:00 to 18:00.